A flame-resistant roofing system is particularly important for buildings protecting something irreplaceable—people. When covering schools, hospitals, factories, hotels and other buildings bustling with human activity, a roofing membrane with flame-resistant properties will help protect lives. Low-slope roofs face a number of incidents, including electrical shorts from mechanics on the roof, lightning strikes, accidental fires caused by individuals working on the roof and even embers from wildfires, fireworks or other sources. How a roof membrane reacts in the face of those challenges is all about what it’s made of. This video illustrates the difference between four common roofing systems. Notice that FiberTite self-extinguishes due to the optimal chemical composition. All buildings must meet fire codes. Choosing a roofing system with far superior fire-resistant characteristics is important in all buildings. When material that hasn’t been exposed to the environment is lab tested for fire-resistant properties, it still contains 100% of the fire-resistant properties. Over time, roofing systems face UV rays, weather and other environmental factors that make them less effective. FiberTite’s DuPont Elvaloy Ketone Ethylene Ester (KEE) ensures the product retains its quality and stability decades longer than other roofing membranes and delivers lasting fire protection. A Fortune 500 customer replaced a relatively new roof with FiberTite after fireworks caused a roof fire on their distribution center. After an electrical short on some rooftop solar panels caused a small fire, a building owner selected FiberTite for the replacement roof. The Grand Ole Opry House in Nashville specified FiberTite for its appearance and durability to protect its building and artifacts from roofing damage. A large theme park in Orlando specified FiberTite specifically to mitigate fires that may be sparked by their nightly fireworks displays. 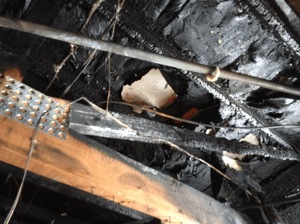 The difference between meeting building code and exceeding it with an inherently flame-resistant roofing material can be the difference between a non-event and significant damage. For a deeper look at how some of the commonly used roofing materials perform when faced with fire, view this comparison. Fire-resistant materials can play a crucial role in both preventing fires and limiting their damage, making proper fire testing and certification critical if you want your roof to be safe, protective and long-lasting. This whitepaper provides an in-depth look at the comprehensive FM and UL testing processes that expose roofing systems to incredibly challenging environments and threats, and how these major testing agencies assign roofing system classifications based on performance. Download your copy of this whitepaper below for a deeper dive into fire ratings and how we prepare for the worst-case scenarios.